Preservation Products / Coming Soon! There is a growing need to preserve and store biological specimens. Traditionally, this is accomplished by simple means, depending upon the characteristics and properties of the material being stored. Temperature is a key parameter for storing cells and tissues but typically storage of these materials involve some form of container (box, tube, etc.) that is kept at room temperature, refrigerated, or frozen. We believe that our line of Preservation Products offer several unique advantages for the storage and preservation of biological materials. OxyStab™ is an exciting and convenient product, inspired by the need to preserve microorganisms in the laboratory. This is a solid agar containing the Oxyrase® Enzyme System. OxyStab™ is ideally used for refrigerated (2-8°C) and room temperature storage. To request additional information or to be included in product updates as we near the launch of these products please email sales@oxyrase.com. Upcoming Events / Spring SCACM 2015 Meeting! 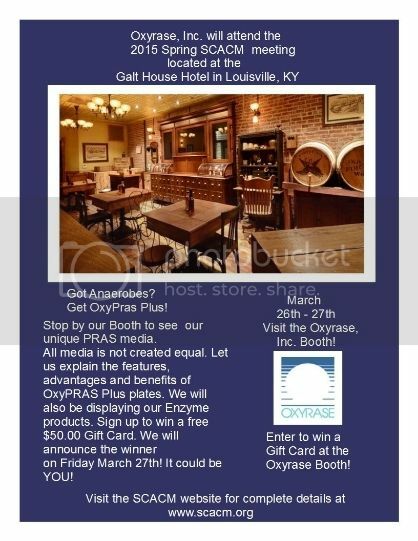 Please visit the Oxyrase, Inc. display at the 2014 Ohio Fall SCACM Meeting in Columbus, Ohio. Learn how to increase your anaerobe recovery! Is there a difference in the recovery of anaerobes under the following scenarios: When specimens are inoculated in Thio Broth? Or inoculated directly to PRAS media and then placed into anaerobic conditions? 1. When specimens are inoculated in Thio Broth? specimens because most specimens for anaerobes contain mixed, multiple microorganisms. Both facultative microbes and anaerobes may be present. Thio Broth will support growth of both. anaerobes has not been good. As a result, many microbiologists have discontinued its use. 2. Inoculated directly to PRAS media and then placed into anaerobic conditions? aerobically. Thio Broth would have a cost advantage. 3. There is a third alternative. Use OxyPRAS Broth and Oxyrase AnaSelect for Broth. facultative microbes. This powerful combination of attributes enhances the recovery of anaerobes from specimens. General Discussion Topics / Question: Difference between PRE-reduction & POST-reduction of media? The 'Pre' in pre-reduction refers to that time before the plate is made. Reduction is done at this step to prevent oxidized products, that are harmful to anaerobes, from being formed during sterilization (autoclaving) of the medium. Harmful oxidized products formed at this stage of media make-up cannot be removed later. The 'Post' in post-reduction refers to that time after the plate is made. Reduction is done at this step to prepare the plate for use, i.e. inoculation with anaerobes. This is done to provide an optimal environment for the anaerobic, bacteria to initiate growth. To make 'Pras' medium (pre-reduced, anaerobically sterilized) requires the pre-reduction step. Some media 'made for anaerobes' only get the post-reduction treatment. A convenient way to visualize the recalcitrance of oxidized products to subsequent alteration is to imagine a rusty nail being put into an anaerobic environment... it does not reduce (remove/reverse) the rust... anymore than putting an oxidized plate, made without pre-reduction, into an anaerobic environment to convert it to a 'Pras' plate. Upcoming Events / Winner of the Gourmet Gift Basket at the Spring SCACM Meeting 2014! of the Gourmet Gift Basket at the Spring SCACM show 2014! Congratulations Peggy! Thanks for visiting the Oxyrase, Inc. Booth!! Question: Difference between PRE-reduction & POST-reduction of anaerobe media?